This Sunday is the finissage of Lichtspiel by London based duo Sebastian Kite & Will Laslett at Import Projects. 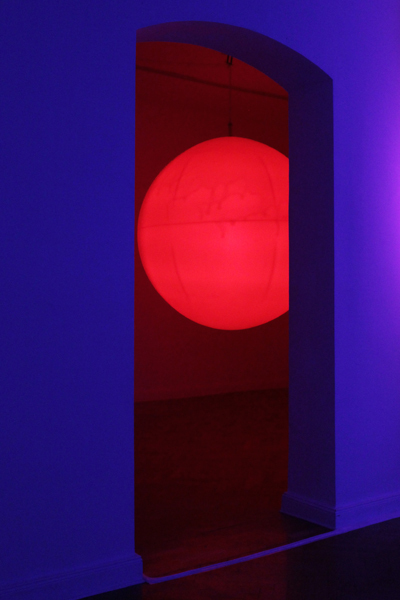 Using light and sound as the primary medium, the exhibition brings together new compositions of Candescence and Orbit, two works that were previously shown at the +-0 Temporary Nightclub at Postbahnhof Berlin, as well as a new multi-video projection titled Reflex. Since meeting at architecture school, the creative pair has produced a wide perimeter of cross-disciplinary projects including live performances, interactive installations, commissions and experiments in Berlin, London and Milan. Their diverse and complex projects have resulted in a breeding ground for experimentation with visual artists, musicians, composers, curators and perfumers. Lichtspiel demonstrates Kite & Laslett’s technical mastery as well as their ability to create strong narratives and ambiences with light and sound. Elizabeth Stevens interviewed the creative duo Kite & Laslett about their first exhibition in a gallery space in Berlin. ELIZABETH STEVENS: Please tell us a bit more about how you met and why you work together? KITE & LASLETT: Will and I both met whilst studying Diploma in Architecture at the Westminster School of Architecture. We were both part of a new-founded design studio unit concerned with temporal issues, exploring media such as film. This was a means to develop and convey architectural ideas, as well as to build installations of these ideas. For the first project, we teamed up to produce a motion-responsive light cube and installed it in the City of London. It was great fun and spurred on a passion in installation making. Stemming from architectural practice, you usually always work in a team. It is a pleasure to have the opportunity to share and bounce ideas between one another, projects become far richer through this process. You are able to take on and fulfill ideas beyond what one can do alone. Beyond architecture, our backgrounds are diverse; Will’s technical interests and my musical interests, yet, we both fuse our ideas together to create the works that they are. This is always a strong overlap of ideas and a wide skill base amongst the two of us, thus we have the capacity to bring our projects to life. In the past, your architectural interventions have consisted of far many components and were larger in scale. How did you pare down these works to fit into the gallery space at Import Projects? Were there any tough decisions you had to make? Our exhibition, Lichtspiel, posed an unprecedented challenge for us to present our installations de-contextualized as sculptural elements, rather than wholly immersive environments. 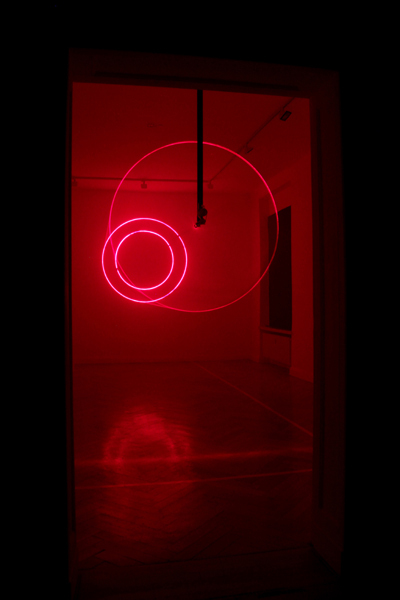 The lives of our installations take on different dynamic arrangements based upon on the context in which they inhabit. Usually, Candescence is presented as a multiple array of spheres. However, in the context of the gallery, the decision was made to have one sphere positioned at the centre of room. 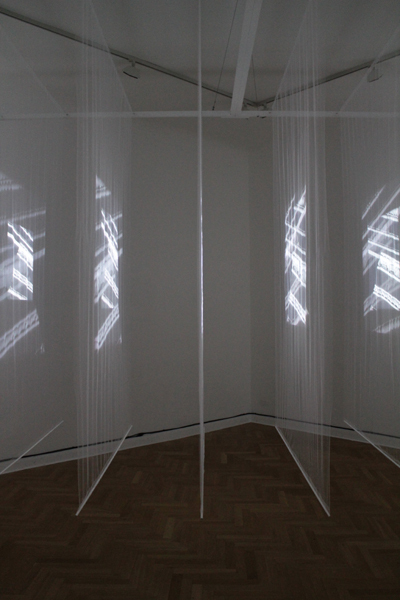 The candescent light was intended to respond to the sound of Enclosure [a sound installation by Kite & Laslett,] giving the piece an aura and character. Both the sound and light of each work passes through the open portals between each room, thus the works have to balance and communicate with one another. The spinning lasers of Orbit, a rather dangerous piece of art, had to be carefully positioned in order to present the essence of the project whilst not decapitating the audience! Originally designed to be suspended in a high-volume space 80m in length, this project could not be shown in its entirety but exemplified up-close the mechanics of this installation. 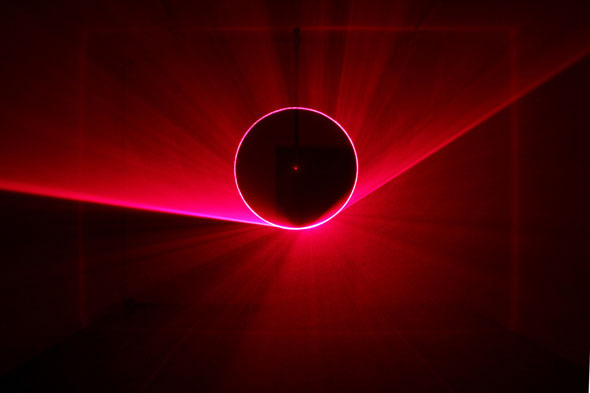 The tough decision to make was with the purpose of the third and final room in that the exhibition would feel incomplete without a visual antidote to the lasers and sphere. 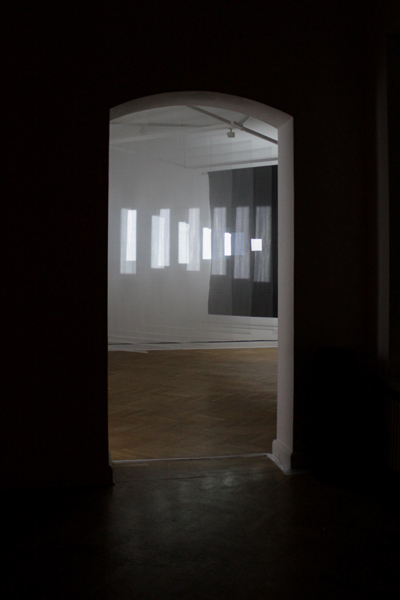 Exploration into the use of projectors at the time led to the creation of an entirely new piece entitled Reflex. As a concept on paper, this new work was the most exciting to see manifest itself. Our creative practice is diverse and ever evolving. Our early works were very much concerned with physical interaction; a literal connection between the body, intervention and space. More recently, our work has shifted both in terms of scale and the notion of interaction. Our works are performative in that they either establish an apparatus with associated elements of performance or are in themselves performative objects. However, at present, we are interested in producing architectural structures, without the paradigm of interaction, exploring purely form making. Can you state direct influences by artists you may have worked with, and perhaps other works of art or artists that influence your work? 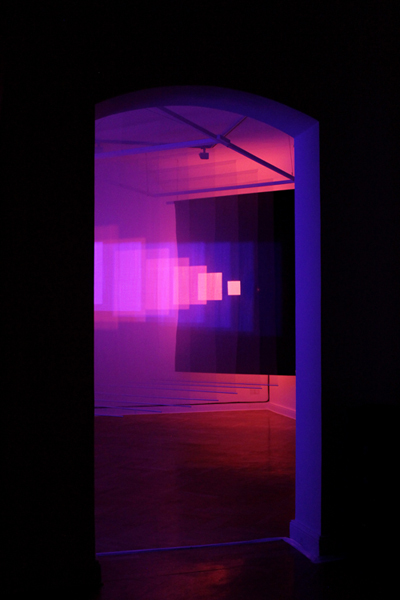 Over the past year, we have worked closely with artists such as composer and installation artist Mira Calix and projection artist Davide Quayola. Calix’s pitch on sound and music and her sensibility towards the spatialisation of her compositions for performance have had a profound impression on our work. Contrarily, Quayola inspired us not only to document films of our installations but to use the medium of film and projection to produce new installations in themselves. We are both great admirers of architectural interventions made by the likes of Christo, James Turrell, Olafur Eliasson and Richard Wilson. Theirs works stand between intervention and architecture, the material and immaterial. We would relish the opportunity to make a work that reaches beyond intervention and into the public realm. Aside from installation artists, we are influenced by modernist composers, writers such as Michel Foucault and Anthony Vidler, early photography, film and a love for Moholy-Nagy and all things Bauhaus. Can you briefly describe your working methods? Obviously your work must be precluded by a blueprint of some sort–how does your training as architects come into play here? The subject of architecture is ever present in our work, in essence, making interventions that engage with architectural space via an interaction with the viewer. Naturally, architectural theory forms an undercurrent in the work but is often combined with other philosophies associated with space such as cybernetics and music. [Since our first projects,] our methods have progressively become more sophisticated and thorough; henceforth we take the approach to construct our ideas fully as drawn, in equal detail to architectural blueprints. Site-specific works require us to carry out full architectural surveys, which are key to honing ideas towards realisation. Without these factors the installations would not be possible. Here there is a passion towards precision, technical efficiency, refinement in materials and elegance. What are your thoughts on the outcome of Lichtspiel? As to the outcome of this exhibition, we are always looking for the unexpected elements in our work; the incidental effects that can only be discovered through experience, illustrating what drawings cannot show. Albeit subjective, these findings, whether prominent or acute, play powerful parts in the installations. Learning from these outcomes, they inspire to form the conceptual basis for new creative directions in themselves. 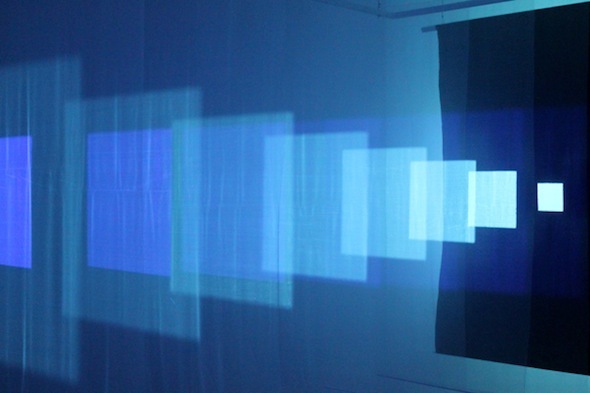 The new projection-based installation Reflex was essentially created as an experiment to explore the medium of dual-projection, spatialising light itself; the immaterial as presented as material. On one hand, this installation is simple in its concept and apparatus but allows scope for complexity. Colour is a tricky subject to tackle, yet this installation provided the freedom to experiment. We learned that the interchangeable pace at which the spectrum of colours crossfade appeared to create its own parallel timescape, creating a sense of time slowed down. We observed that the audience spent more time in this installation because of the anticipated change in colour of the room. It is really interesting for us to see our works de-contextualised and in the remit of the white cube of artistic interrogation. The inverse to usual practice is happening, in that, as much as the works emit light, revealing and transforming the experience of the rooms, they reflect examination back upon themselves, appreciated as sculptural objects in their own right.